These colours looks gorgeous. At such low prices, I might have to give the Rimmel and Maybelline palettes a try. I loove summery shades!, the Rimmel and Maybelinne are so great for the price!, really worth it! I haven't tried Rimmel or Maybelline palettes before so may add them to my list of palettes to try. They are such gorgeous shades. Rimmel and Maybelline are both amazing brands, really affordable with great quality products. It's just stunning, isn't it? I was the same and i am sooo glad I eventually got my hands on it, it's so worth every penny. I was actually looking at that Too Faced palette last week! It's gorgeous and I'm glad to see it has good pigmentation. Do you have Clinique? They usually have great seasonal palettes, too. I love the too faced palette, it really is one of my favourites of the trio. I haven't tried clinique yet, I would like too. Those colours are wonderful and seriously loving these photos!! I love them soo much and aw, thankyou!. Girl your flatlay game is ON POINT in this post! 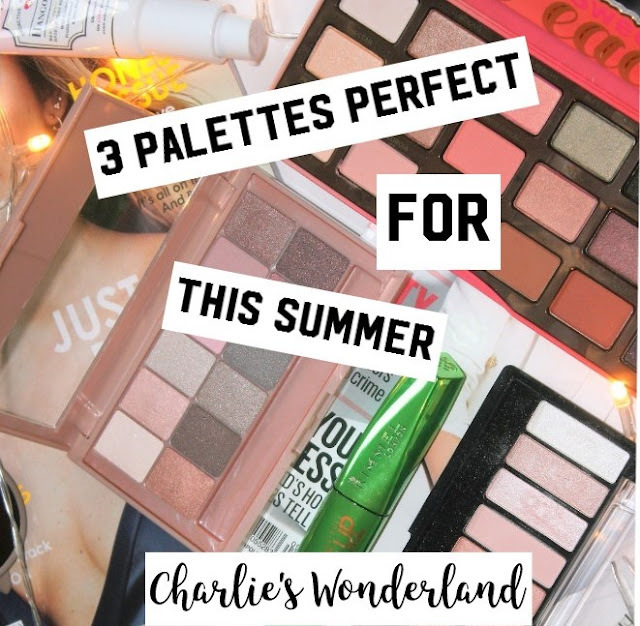 I absolutely *love* the Maybelline and Rimmel palettes - I swear the Rimmel one I have is a Naked palette dupe! I keep seeing so many great things about Too Faced and you've totally swayed me in this post to give them a go! I swear by eyeshadow palettes so I LOVED this post! Aw thankyou so much!, I spotted the naked dupe as well which was the one i thought I picked up originally haha!. I lovee too faced, the quality is incredible!. Ahh the sweet peach palette is one of my all time faves! it's becoming one of my go too's - I love it so much! me too!, the blushed nudes is so perfect for this time of year!. I'm going to have to try some of these out!! I'm rubbish with eyeshaddow but I really need to try more hhaha loved reading this!!! me too!, I'm finding it much easier to learn with the too faced palette because of how easy the shadows are to work with, thankyou! !.